Chapter 8 Interaction Devices - CIS 4372 HCI and Data Viz. It is often convenient to point at and select items. Reduce typographic errors with a keyboard. Important for small devices and large wall displays to make keyboard interaction less practical. Select - choose from a set of items, used in traditional menu selection, the identification of objects of interest. 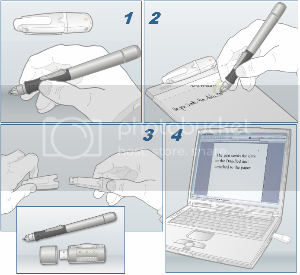 Position –Users choose a point in a one-, two- , three- or higher dimensional space. May be used to create a drawing, to place a new window or drag a block of text. Orient - Choose a direction in a one-, two-, or higher dimensional space. May rotate a symbol on screen or indicate a direction of motion. Path - Rapidly perform a series of positioning and orientation operations. Such as a curving line in a drawing program. Gesture- Indicate an action to perform by executing a simple gesture, such as a swipe motion to the left or right to turn a page. Non standard devices, the other white meat. 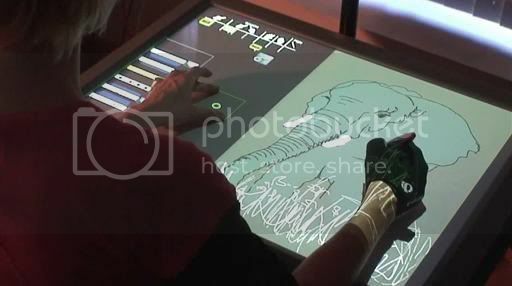 * Allows users to use both hands or multiple fingers, allows multiple users to work together on a shared surface. Non-dominant hand sets a frame of reference in which the dominate hand operates in a more precise fashion. Non-dominant hand selects actions while the dominant hand selects the objects of the operation. 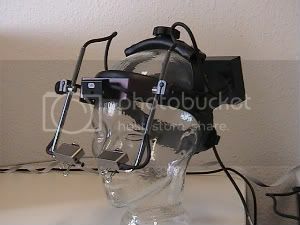 Gaze detecting controllers that use video camera image recognition of the pupil position to give 1 or 2 degree accuracy. * Depend on embedding sensing technologies into the environment. Such as Radio frequency identification tags can trigger reloading of personal files on a computer. * Positioning of physical objects can specify modes or trigger actions. Are added to handheld devices can enrich the interaction with the devices themselves. Example, the accelerometers in the iPhones that can detect changes in the devices orientation, causing the display to switch between portrait and landscape. Made of sleek black spandex with attached fiber optic sensors to measure angles of finger joints. This allows for commands such as closed fist, open hand, middle finger and so on. Attractive to game developers and virtual reality devotees. a and b are empirically determined constants, that are device dependent. 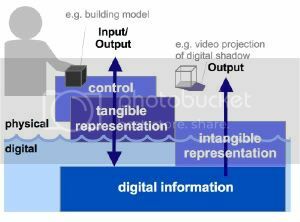 Speaker-independent training – not as accurate but eliminates training to expand the scope of commercial applications. Speech dictation products, IBM Via Voice: to help dictate letters and compose reports verbally for automatic transcription. Can be used to scan and retrieve radio or television programs, court preceding, lectures or telephone calls for specific words or topics. Summaries can be generated from audio conversations. Voicemail Systems: Telephone based speech systems enabling users to store or forward messages. 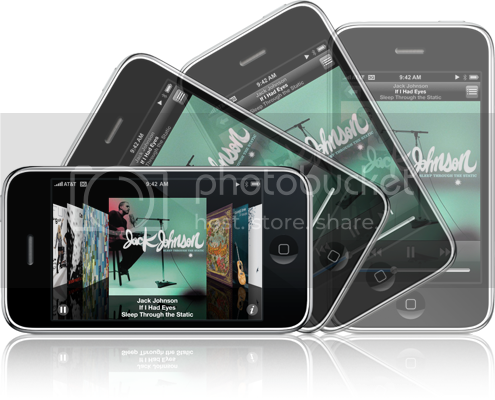 Apple’s iPod: allows to store large audio databases and retrieve selected segments. Used in Automobile navigation systems, Internet services, utility-control rooms, and children’s games. Web-based voice applications and telephone-based voice information systems. The bells and whistle sounds from a computer. Earcons: sounds whose meanings must be learned by use of Auditory Icons to help reinforce the visual metaphors in a graphical user interface. 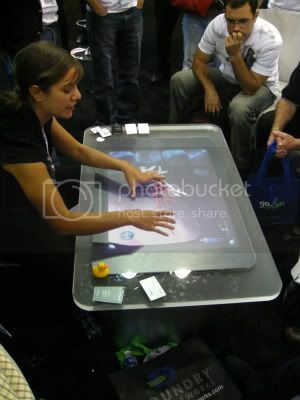 The display is the primary source of feedback to users from the computer. LED technology is advancing making it usable for smaller applications. Common in control rooms, classrooms, and military operations. Help to build awareness through a common understanding. Used to use CRT matrices. Now mostly use frontal or rear projection. Do not require high resolution. Traditional desktop interaction techniques become impractical. Usually employ multiple traditional displays. Allows users to have multiple open windows. Most used in creative applications. Increased workspace or increased clutter? HUD projects information into the users field of vision. Most often used in vehicles: cars, planes, etc. HMD is used in virtual or augmented reality. Applications are designed to use every available pixel. Being able to zoom is highly important. Poor readability is an issue.